This post is based on an academic paper by Daniel Orenstein and Steven Hamburg. The paper sheds light on the Israeli planning system which seems to be producing homogeneous and wasteful products. The full name of the paper is: “Population and pavement: population growth and land development in Israel” and it was published in Population and Environement journal. 1. What is the connection between population growth in Israel and the rate of converting open land to built-up land? 2. Does the scale of analysis affect the strength and magitude of this correlation (scale means national, district or local)? 3. What are the regulatory means that infulence the rate of open land conversion and in what ways? To carry out the research a number of specific areas all across where chosen including urban, suburban and rural settlements which are also ethnically diverse (meaning taking into account also predominately Arab settlements and not only predominately Jewish settlements). Out of 250 local authorities in Israel 40 were examined (for more please see pager 9-10 in the paper itself). After the selection of the research areas the paper elaborates on the methods used, which employed analysis of aerial photos from different years in order to assess the amoung of land that was converted from open to built. To make the story short I’ll focus on the major findings that arise from this paper. The first important finding in the national level is that the rate of open land conversion to built-up land is higher than the rate in which the population is growing. Furthermore, this conversion rate is even higher if the sparsely populated Galilee and Negev regions are taken out of the equation. Namely, the open land we build on for the additional population is being eroded at a rate that is growing over time. We waste our land faster than we used to. Another somewhat intuitive finding shows that the rate of sprawl (open land conversion for each additional resident) is higher for the rural settlements and for the northern settlements. Sprawl (more space consumed per additional unit of population) is increasing over time at both the national and district scale, yet the locality data do not corroborate these results. The locality data suggest a growing homogenization of development across the Israeli landscape. The amount of land developed in the peripheral areas was significantly higher than in the core area, once variation due to population growth and other related factors are removed. Likewise, development in Arab localities was less than in Jewish localities (controlling for other factors), although this difference was statistically significant only for the full 1961–1995 study period. These results reflect a consistent Israeli policy to encourage internal migration of Jewish citizens to the peripheral areas, while concurrently restraining the growth of Arab localities (Falah 1991; Khamaisi 1993; Yiftachel and Rumley 1991), despite the preference of most Jews to live in high-density urban communities in the geographic core area of the country (Kellerman 1993). Various national policies have attempted to attract Jews to the peripheral areas (Kellerman 1993; Newman 1984, 1989). Among them was the development of small, exurban communities with larger homes. By attracting people to these communities, policy magnifies the impact of local population growth on open space in Jewish, rural localities where the amount of land developed per capita is an order of magnitude higher than in any other type of development. One somewhat surprising result of the population–development relationship is that for districts in which open land is becoming increasingly scarce, an expected slowing of land development relative to population growth with a concomitant increased importance of open space was not evident. We would have expected to see the rate of land development slow as open space became increasingly rare. Rather, we see the rate of loss of open-space increase (and the rate of land development increase) as open land reserves become smaller. This is true even in the case of the Tel Aviv district, where only a small amount of land (*20%) remained open space by 1990. In conclusion – at the local level our planning is becoming more and more uniform and provides indication about a central technocratic systems that operate with no context, and creates a uniform built environment. At the district level we are unable to save the open land at all. And at the national level, the loss of open land is at a higher rate than the rate of population growth. For the good of this small and precious country, its planning systems need to be completely reorganized and most of the regulation and the ideology standing behind them have to be shredded – the sooner the better. You can access the full paper here (and if you do not have access and still want to read it you can leave a reply or contact me). The two largest municipal authorities in Israel, Tel Aviv and Jerusalem, decided to help their train stations regain their former glory from the Ottoman period (a period that was definitely better in terms of urban planning). Unfortunately, instead of using the money to improve the convenience and operation of the actual train stations, they have spent an enournous sum of money on defunct stations that serve no trasportation purposes. The city of Tel Aviv has revamped the Hatachana Compound (literally – The Station) and turned it into an open air mall, but its usage is rather low and the market that opened there has already closed down due to slow business. This came as no surprise, since the compound sits on the remnants of Manshiya (a neighborhood of Yaffo which was completely destroyed in the 1960s in a slum clearence scheme that created a lot of surface parking while diminishing housing supply). This compound is relatively inaccessible, and can only be reached by car, but since parking lots are not that interesting to visit this compound is not succeeding. 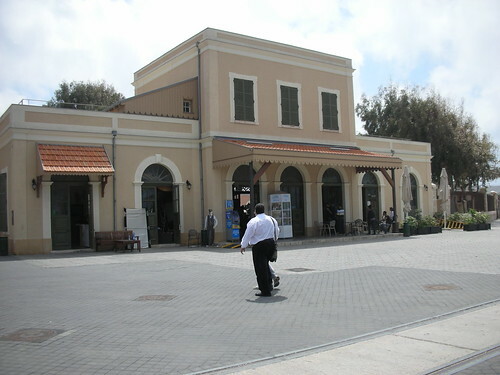 The Station Compound in Tel Aviv. On the road to nowhere. Not to be left behind, the municipality of Jerusalem decided to turn its deserted old train station to an open air mall, too. In contrast to the Tel Avivian compound, the Jerusalem station compound (which is called The First Station) is slightly less disconnected from the city, even though its hiding behind the German Colony neighborhood, which has its own successful commercial street. The common featrues of both these stations is that no trains have pass by them in years. The station in Tel Aviv has been defunct since the establishment of the state in 1948 and the station in Jerusalem has been deserted for 15 years. But it doesn’t have to be like this. Many cities in the world are renovating major transport terminals that are actually used for transportation and not just for consumption. Train station are obvious examples – the Utrecht central station is undergoing a major renovation. Another good example is the Antwerp central train station, which may be the most beautiful station anywhere in the world, and has undergone a major renovation in the previous decade. Even in North America there are more than a few examples. 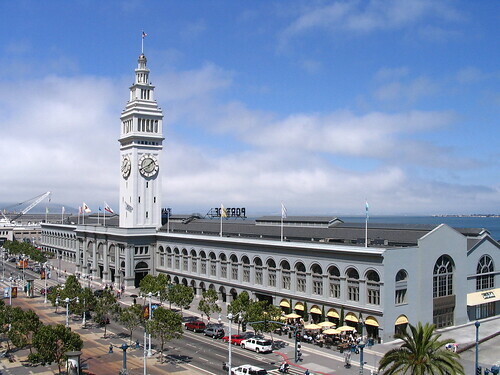 For instance, we can look at the Ferry Building in San Francisco. This building was opened at the same year as Jerusalem first station (1892). It was never completely abandoned, but it was run down for many years, due to the highway that ran over it and came down in 1989, among other things. In 2003 this building was reopened after a massive overhaul and the ferry service came back and was expanded. On top of the maritime accessibility that this building has, it is also situated near a major intersection of the San Francisco light rail system (which is rather flimsy). 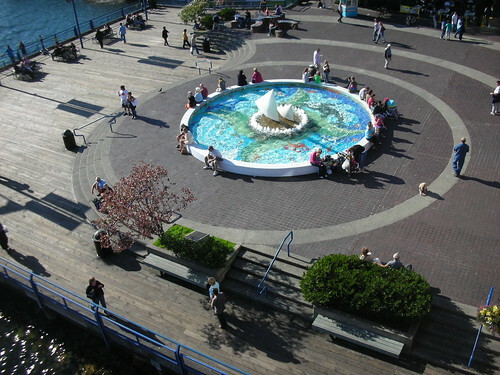 Another good case is Lonsdale Quay in a city called North Vancouver (which actually lies north of Vancouver). This is another main station of ferries leading from Vancouver’s northern suburbs to the city itself. Before the conversion to a ferry station, this place was a dockyark. This is another fancy transportation hub, which not only cater to tourists, but also to many locals who pass there every day. Do Comprehensive Land-Use Plans Have any Real Meaning? The Israeli planning system deserves a few posts on its problems and challenges. Today, we’ll deal with a study that attempts to evaluate the effectiveness of district master plans with regards to the actual implementation. This post is based on an academic paper written by Dr. Nurit Alfasi, Mr. Jonathan Almagor and Prof. Itzhak Benenson, and which can be found here. This paper was published in Land Use Policy Journal under the title: “The actual impact of comprehensive land-use plans: Insights from high resolution observations.” The researchers have made an attempt to estimate how much does actual construction conform to the actual plans by comparing aerial photographs to district master plans. The results of this study shed light on the ineffectiveness of the urban planning in Israel and should signal to the Minstry of Internal Affairs (that is responsible for most of the actual planning) that it is time to change the way in which the system operates. First, we must clarify what is meant by district master plans. Israel is divided into six different administrative districts. This division was first created during the British Mandate period and was slightly changed after the establishment of the state of Israel, but is no longer relevant. For example, the Tel Aviv District includes the contiguous urban area that was already built in 1948 (Tel Aviv and its inner suburbs from Hertzliya in the north to Bat Yam in the south). The Central District includes what used to be the agricultural hinterland of Tel Aviv and is now part of the suburban sprawl from Natanya to Rishon Letziyon. Even the Southern District includes part of Tel Aviv Metropolitan area, especially the large suburb of Ashdod. So, after understanding this anachronistic districts division we need to deal with the actual district master plan. This is a comprehensive plan that describes the entire land-use specifications (built and planned) for the whole district. Each district has such a plan and this plan is supposed to set the expected development in the district and has to be updated once all of its planned development have been built. In theory, most of the construction should follow the district master plan, and the discussions in the district planning comittee should ensure that all roads, buildings and parks are built according to the approved plan. The study dealt with the Central District for its area of reserach. This is the district with the most intense real estate activity in Israel and includes all the growing suburbs of Tel Aviv outside of the inner ring. The study focused on the district master plan also knows as DOP 3 (District Ouline Plan no. 3), which was approved back in 1982. In order to compare the actual construction to the plan aerial photographs from the years 1980, 1990, 2000 and 2006 were used – all in all 26 years of development. DOP 3 itself has undergone an update process in 2002 and became DOP 3/21. Twelve different areas inside the Central Districty were sampled, constituting about ten percent of the entire district area. Of all the anecdotes that come out from this study, the most ridiculous case is illustrated in the case of a newly established suburb in the 1980s titled Shoham. Shoham was founded entirely on and area defined as a future public park, meant to be kept open for its unique environmental values (in sharp contrast to the area defined as farmland, which are easy to run over with urban development.) DOP 3 was approved in 1982 and just a few years down the line, the National Planning Council made the decision to build Shoham. But the problems do not relate just to the 1980s and 1990s. In 2002, a new DOP 3 was approved under the name DOP 3/21 which paractically approved almost all the deviations that occured in the preceding years. Over the four years that were checked after the new DOP was approved, non-conforming development has already started to be prevalent and reached 30 percent in a number of the sampled areas. At the conclusion of the study, the reserachers elaborate on effective planning methods to replace the current system. These methods do not include rigid and meaningless land-use maps, but a defined set of planning principles by which to evaluate local plans before their approval and execution. Such an action can guarantee a faster and more flexible design that also gives better results. I hope that theserecommedations will not remain only on paper. The complete paper can be found here.